Thames Valley Police is appealing for witnesses after a woman was assaulted in Oxford. The incident happened on Headington Hill footpath near the bridge at 1am today (24/4). The victim, a 25-year-old woman, was approached by a man who assaulted her. The victim sustained facial injuries including a broken nose and was taken to the John Radcliffe Hospital for treatment. The offender is described as black, in his mid-twenties and slim. He was wearing a grey tracksuit. Investigating officer PC Christopher Tack, based at St Aldates Police Station, said: “This was an unprovoked assault which resulted in the victim requiring medical treatment. The internet is a fantastic place for young people to learn, play and socialise but it’s vital that they’re aware of its dangers and how to stay safe. Manage parental controls on all your family’s devices. If you need help setting up parental controls, adjusting privacy settings or need advice on social networks call the free O2 & NSPCC helpline on 0808 800 5002. If you fall victim to cyber crime or experience an attempted scam report it to Action Fraud on 0300 123 2040 or visit www.actionfraud.police.uk. For more information and advice visit www.thamesvalley.police.uk/pyw. Thames Valley Police is appealing for information regarding the whereabouts of two men who are wanted in connection with burglaries in Oxford. Lewis Felton, aged 27, and Kane Jones, aged 21, are wanted in connection with a number of burglaries that happened in Oxford on the same day last year. The first burglary happened in Coniston Avenue, Marston, at about 2.10am on Tuesday 14 November. During the burglary five offenders, all wearing hooded tops with the hoods up, forced their way into the property and stole a set of car keys to a Mazda 3 VRM SL54 KVZ. Two of the offenders then drove the Mazda, which has tinted windows and gold alloy wheels, towards Headley Way. The other three offenders walked away from the scene towards Ambleside Drive. A purple coloured Adidas rucksack was also stolen. The rucksack contained a BMW employee pass and a 50ml bottle of DKNY gold perfume. The second burglary happened in Valentia Road at about 2.30am. During the burglary the offenders forced open a door to the property and stole a set of keys to a Land Rover with a 2014 number plate. Subsequently, the Land Rover was stolen. The third burglary occurred in Hill Top Road at about 2.45am. The offenders forced their way into the property through a window and stole a set of keys to a BMW X5. The vehicle was later recovered in Prospect Path. A set of house keys, watch and a Samsung phone were also taken. Investigating officer, PC Sian Lewis of the Local Policing Area team in Oxfordshire, said: “I would appeal to anyone who has any information about the burglaries or the whereabouts of Lewis Felton and Kane Jones to contact police immediately. “Felton has links to Berinsfield, Kidlington and Oxford and Jones has links to Kidlington and Oxford. “It is believed that the offenders may have used a silver Vauxhall, possibly an Astra or Corsa, during the burglaries. “If anyone has any information please call the 24-hour Thames Valley Police enquiry centre on 101 and quote reference 43170338429. “If you do not want to speak directly to the police you can contact the independent charity Crimestoppers anonymously on 0800 555 111. No personal details are taken, information is not traced or recorded and you will not go to court. “I would like to reassure residents that the force takes burglary extremely seriously. We realise the impact that such an intrusive crime has on its victims. Witness Appeal after Robbery in Osler Road, Oxford. On Monday 18/09 at 20:18 a man parked his car on Osler Road, as he got out of the car he was approached from behind. The man handed over the keys to the suspect, a second offender was standing watching, both offender’s got into the car and drove down Osler Road away from London Road, Headington. The vehicle is a silver Lexus RX400 registration number PX5 6U**. The first male had an Eastern European accent, he was approximately 6ft tall, stocky build, wearing a dark coloured jacket. The second male was also approximately 6ft tall, stocky build, short brown hair wearing dark clothing. Investigating officer, Detective Constable Lisa Chapman, said: “We would like to speak to anyone who may have witnessed this incident. 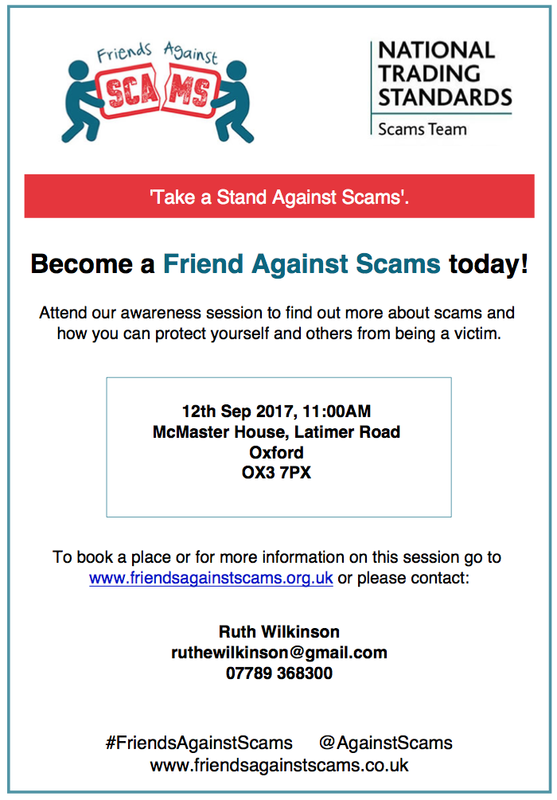 Ruth will deliver the first of a series of Scam assessment talks in Headington Ward on Tuesday 12th September. This will be a closed session but if you would like more information on future events, please contact her for details. PCC Anthony Stansfeld has launched a survey seeking feedback from residents of the Thames Valley on policing and crime. The results of the survey will help inform the next Police and Crime Plan which is due to be published before March 2017. The survey is hosted on the PCC website www.thamesvalley-pcc.gov.uk/survey. It should take no more than 10 minutes to complete and is open until 30 September 2016. Anyone who is either living or working in the Thames Valley is eligible to complete it. The survey also seeks the views from victims of crime with the aim of improving the victims experience. Hard copies of the survey are also available on request by contacting the Office of the Police and Crime Commissioner on 01865 846780. Hustings independently organised and chaired. Come along to Tuesday’s Headington Ward Focus meeting! It’s on 24 February at the Manor Hospital from 6:00-7:30 pm. with guest speakers talking about antisocial behaviour and getting in touch with the council. 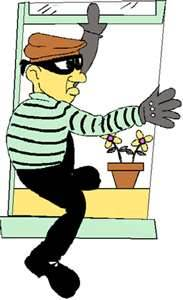 The majority of burglars are opportunistic; they will look for properties where they think they can enter unobserved and ‘work’ undisturbed. Three simple actions should help deter these types of criminals – Light it, Lock it, List it. * Install low-wattage timed security lighting that stays on throughout the night. * Make sure your house looks occupied even when it isn’t. Use an automatic timer switch to turn interior lights on and off. * Never leave keys in the door, they can assist a burglar when breaking into your house and when leaving. * Keep your front and back doors shut and locked – even when you are at home. * Fit window locks and ensure French windows and patio doors are secure. * Never leave car keys or other valuables in view of a letterbox or window, tools can be used to reach through and pick them up. * Secure your garage and shed too – equipment kept in a garage or shed can be just as tempting for a burglar. * If you can, install a burglar alarm and set it every time you leave your home. It’s free of charge and can increase your chances of being reunited with your property. Thames Valley Police would like make you aware of a card fraud scam which is occurring across the county with victims appearing in Oxford. It is a card fraud scam, where the offender rings the victim saying they are calling from Harrods or similar company and are informing the victim that someone has tried to pay for something costing a large amount on their card. The victim says this has not been authorised and the offender tells the victim to call their bank using the number on the back of the debit/debit card. The offender leaves the line open so the victim is in fact not dialling out at all. The victim believes they are speaking to the bank when they are speaking to another offender claiming to be from the victim’s bank. They ask various questions to verify the identity of the victim including name, address and DOB, mother’s maiden name and last transactions. An automated voice then asks the victim to manually enter their pin number on the keypad. Once this has been done the offender claims the transaction has been stopped and the card cancelled. The offender then asks the victim to place the card into an envelope and says a courier will call to collect it. A taxi then arrives at the victims address to collect the card and take it away. Thames Valley Police recommend that you never disclose your PIN number, login details or passwords in response to unsolicited emails or callers claiming to be from your bank, the card company or the police. A genuine caller would never ask for this information over the phone.